What might God do if every married person in your church prayed for their spouse every day? We believe He might change our country and the world. Prayer changes things because God answers prayer. Everyone knows couples ought to pray for one another – but how many actually do it? Here’s a next step all the couples in your church could take to build a better marriage – pray the 68-word Marriage Prayer each day for 21 days. Click here to order sets of 50 cards. 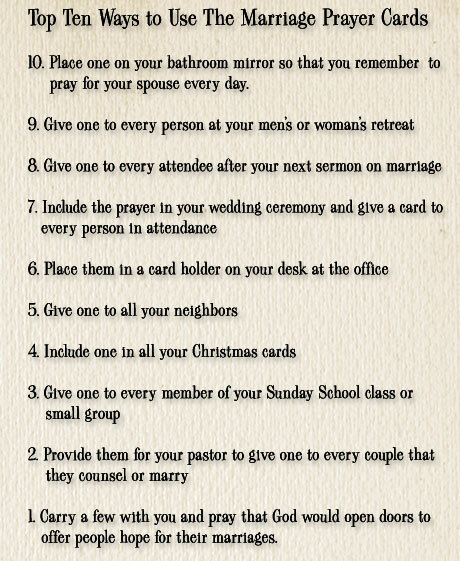 We want to help the couples in your church pray for one another every day! We are providing the marketing materials you need to implement The Marriage Prayer Adventure with your congregation. We’ve produced graphics for posters, bulletin inserts, powerpoint backgrounds, sermon outlines, a couple’s night out invitation, and more – all designed to help you reach couples in your church and community. You can even bring in one of our faculty for a Marriage Prayer Adventure Evening at your church! Click here to see how to implement The Marriage Prayer Adventure in your church. The book The Marriage Prayer helps couples apply biblical principles to real life. Each chapter is anchored by a “true story” case study from couples with combined marriage experience of 264 years! Click here to read the introduction and a sample chapter. The human brain is a funny thing. Why do you remember one thing and forget something else? Why is one thing interesting and something else boring? We took advantage of the latest research while writing this book. The graphical style and interactive components make it more likely that you and other couples in your group will remember and act on what you read. Click here to learn more about how we wrote the book and why!